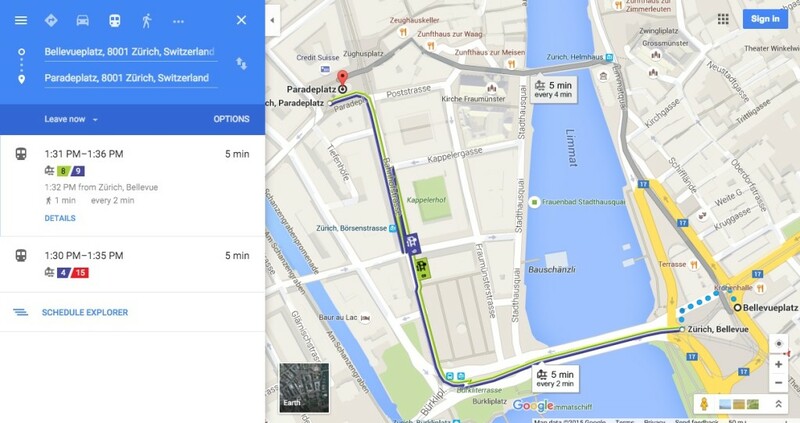 Google Map of Zurich with public transport information. Yesterday’s Gov Camp Vienna 2015 was another in their great series of un-conferences held on civic applications and open data to improve government in Vienna (Austria). Vienna has done a great job opening data sets (German) and encouraging the development of apps and other open government projects. However, one big problem in Vienna is that the city’s public transport agency (WienerLinien) does not yet provide data in the GTFS (General Transit Feed Specification). Consequently, when you search for transit directions in Vienna using Google Maps, you’ll be directed to some crazy trips. Why? Because the Austrian Railway DOES put their data in GTFS! So Google Transit sends you on convoluted train trips through the city when you just need to go two Metro stops. You get sent walking to a railway station, boarding an infrequent train, and walking back from a railway station to your destination. For some reason – unlike most major public transport operators! – the WienerLinien has not seen fit to provide their data in GTFS format. Of course they do have their own nice public transport application called qando (rated 3 stars on iTunes and 4 stars on Android). But how many of our millions of tourists know about it? And, why download it for a short visit to Vienna? And … not providing open data in the accepted standard formats hurts Vienna’s application development community by forcing them to develop unique code for Vienna. In short, no one wins with the WienerLinien’s shortsighted data policy.